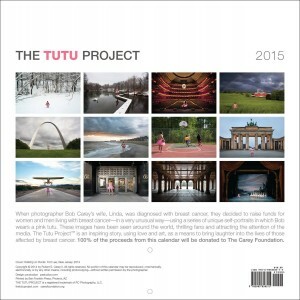 The Carey Foundation has produced The Tutu Project Calendar and now we need your help in getting it to cancer centers across America. We are fundraising for the POSTAGE to send these Packages of Love to over 1,200 men and women battling breast cancer. We want them to receive a smile and your support through this program! 1. Donate any amount towards postage. Every $25.00 delivers a Bundle of twenty calendars to a cancer center of our choice across America. We plan to send at least one per state. 2. Sponsor an entire bundle for $325, and YOU choose the cancer center. We will include your name in the letter the cancer center receives. Our team will call you directly to verify all the details. We will scream thank you from the top of all our social media properties, and include your name in the letter to the center. Remember, every dollar makes a difference so thank you for supporting this effort. You help with postage, the Carey Foundation donates the calendars, and over 1,000 families are touched with a bit of laughter and kindness! Once you submit your donation, a team member will email you to make detailed arrangements. So, take a look at what the calendar looks like: they’re a compilation of professional photos Bob Carey took around the country while traveling to raise awareness to the cause. Your donation will make cancer patients, caregivers, families and survivors very happy!